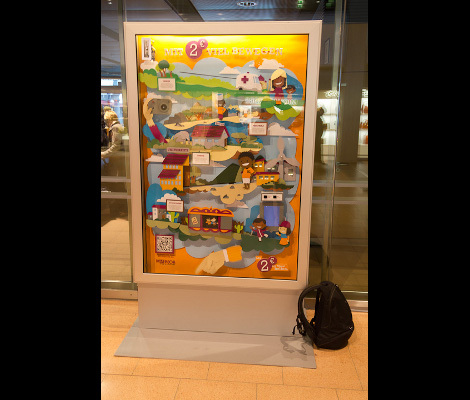 This kiosk was conceived as an interactive poster to help raise donations for a German relief organization. Instead of just providing a coin jar, the piece puts on a little show of transporting a two-Euro coin from the slot at the top to the repository in the base. Along the way many of the parts move, telling a story in that Rube Goldberg sort of way. What is surprising to us is how much this looks like one of our own projects — at least up to the point that the display is painted. The link above shows off some pictures from the development stages. The prototype shapes up on an oddly shaped scrap of plywood with the coin’s path plotted out. After the particulars of a trip from point A to point B were established the empty spaces were filled in to add visual interest. If you take a gander at the back of the plywood you get an eyeful of protoboard and draped wires. A camera, Mac Mini, and Dropbox were included in the mix to share an image of the donor on the group’s Facebook page (with the donor’s consent of course). The piece had a month-long home in the Hamburg airport earlier this year. See what that looked like in the video clip after the break. Very COOL I always enjoyed those giant funnels you could spin coins into at malls for the Salvation Army. My brothers and I would place two coins in at the same time and see if they would hit each other and if they did, witch would knock the other into the center. Instant gratification! Not only do you get the heart warming knowledge your money is going to do some good, you get a show as well. I’m sure the piece cost a bit to make, but the amount it pulls in surely will compensate. People are probably more willing to donate just to watch it. I remember when I was in school there were a bunch of smaller-scale versions of these all over the place as skill games, where you tried to get your coin back again at the bottom by getting it past a bunch of coin-stealing obstacles…. Is that a backpack beside it? No, it’s a bomb, everybody run! The only thing that makes me wonder is if the current cost doesn’t dig in too much into the 2 euro donation.